Earlier this week, I was reading a piece by Stanley Fish on the New York Times Web site. Fish — an academic and a regular contributor to the Times’s on-line efforts — commented on the 2013 John Dewey lectures that were given by Noam Chomsky at Columbia University. In his hyper-creative film, Gondry (Eternal Sunshine of the Spotless Mind) interviews Chomsky, who is probably best known to most of us as a political thinker operating from the left side of the spectrum. Gondry mostly focus on Chomsky, the linguist. As a filmmaker, Gondry remains unbound by convention. His mostly animated documentary is supplemented by filmed interviews with Gondry. 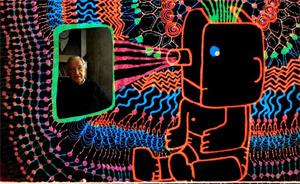 It’s as if Gondry’s using his drawing skills to keep pace with leaps in Chomsky’s thinking. The mixture of animation and talk can be as overwhelming as it is intoxicating, but I was grateful to Gondry for spending time on Grondry’s linguistic theories, which — to the extent that I understood them — seemed quite interesting. Gondry, whose English is thickly accented by his native French, can be heard in some interviews, and he’s not always confident about being a worthy conversational match for Chomsky. I could rattle on, but let me simply say that Gondry’s documentary, which also deals with Chomsky as a kid, as a father and as a husband to his late wife, can be equally stimulating and confusing as it breezes by in its steadfastly original way.